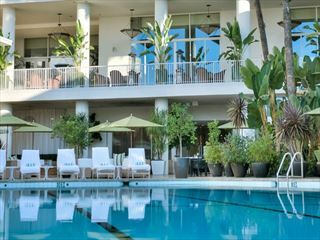 A relaxed and friendly hotel in the luxurious Beverly Hills area, the Beverly Hills Marriott is set just a short distance from the lavish boutiques and gourmet restaurants this region is renowned for. The hotel is conveniently placed just moments from the city’s main attractions, ensuring you have plenty of opportunities to make the most of all that Los Angeles has to offer. The outdoor pool is the perfect spot to unwind in the sunshine and enjoy the Californian climate and there’s also a fitness centre if you want to keep active during your stay. The restaurant and lounge bar serve up classic favourites, light bites and zesty cocktails; you’ll also be close to cafés, bars and restaurants in the area too if you want to try out some of the nearby venues. Enjoy warm hospitality and a friendly welcome as part of your Los Angeles experience with your stay at this modern hotel. 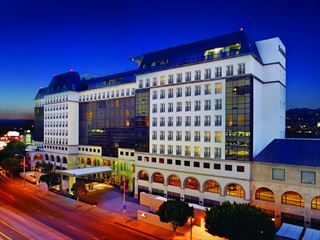 The hotel is situated in Beverly Hills, within walking distance of the restaurants and shops of Rodeo Drive and Wilshire Boulevard. The hotel has 258 rooms and 10 suites. In the heart of Los Angeles’ downtown financial district, the landmark Westin Bonaventure Hotel & Suites is ideally located. You'll have easy access to cultural attractions, as well as nearby beaches, the Los Angeles Convention Centre and the Staples Centre.